This entry was posted in Uncategorized on September 30, 2010 by Gary. 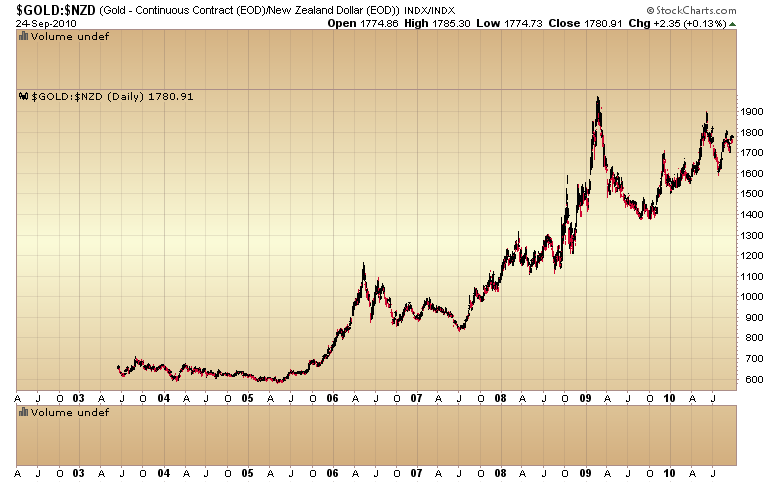 The question was posed that perhaps gold is only rising because the dollar is falling. While every C-wave has been driven by a collapsing dollar you will see in the next several charts that gold is rising in every currency. Every country is debasing their currency. 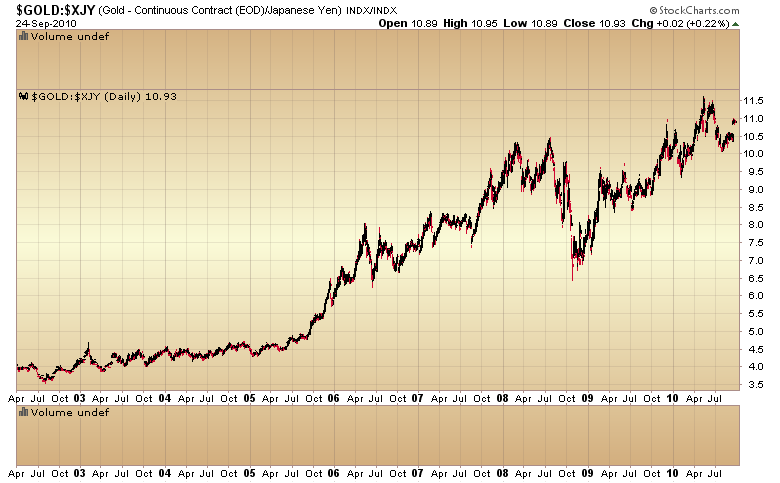 As you can see gold is rising in all currencies even in the strongest of all currencies, the Yen. 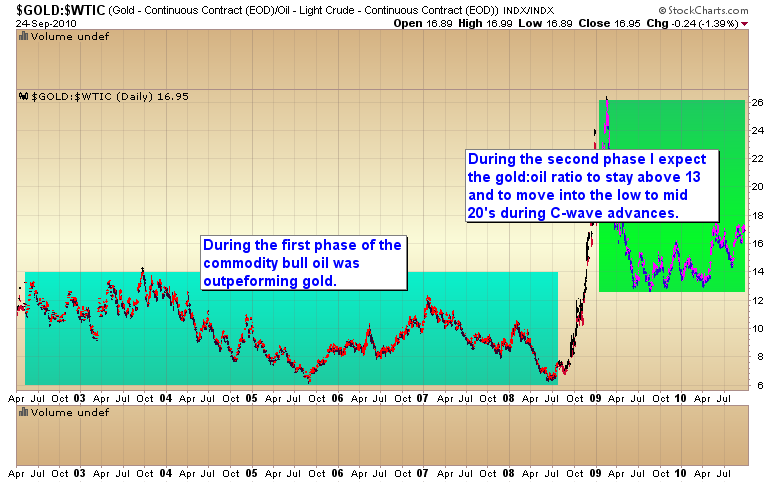 What’s more, gold is also rising against all other commodities since late `05. Remember how I’ve pointed out that oil was the leader during the first phase of the commodity bull and how it should under perform during the second phase. That is because the fundamentals are now impaired in the energy markets but are improving in the precious metals sector. I’ve been of the opinion that the gold:oil ratio will now remain in a range above 13 for the rest of the commodity bull with occasional spikes above 20 as C-waves progress. At the moment the gold: oil ratio is at 17. I expect that will move up to or above 22 by the end of the current C-wave sometime this spring. This entry was posted in Uncategorized on September 26, 2010 by Gary. Alright I’ve had enough of the troll investation for the time being. If you want to comment on the blog you will have to create a google account. This entry was posted in Uncategorized on September 24, 2010 by Gary. It’s been my expectation that gold would manage to rally at least to $1300 before dropping into the now due daily cycle low. 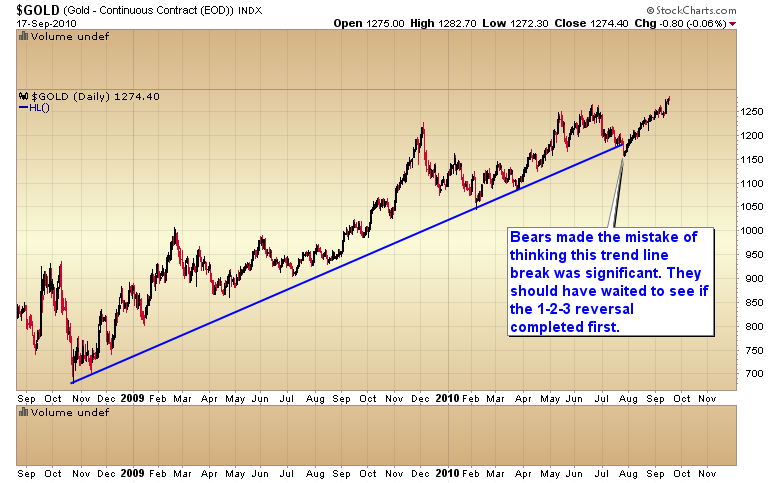 We are now ready to test that theory as gold has tagged $1300 this morning. The rest of the sector is also mashed right up against all time or bull market highs. I have my doubts that we will see all these resistance levels broken on the first try. We are also deep into the timing band for a daily cycle correction. 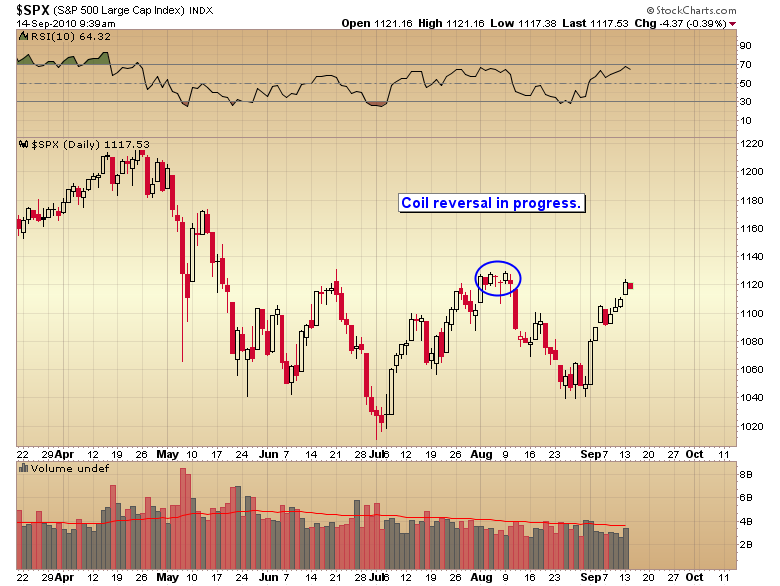 This would be the most logical level for a corrective move to initiate from. If gold is in a runaway move then any correction should hold within a 25 to 40 point range. 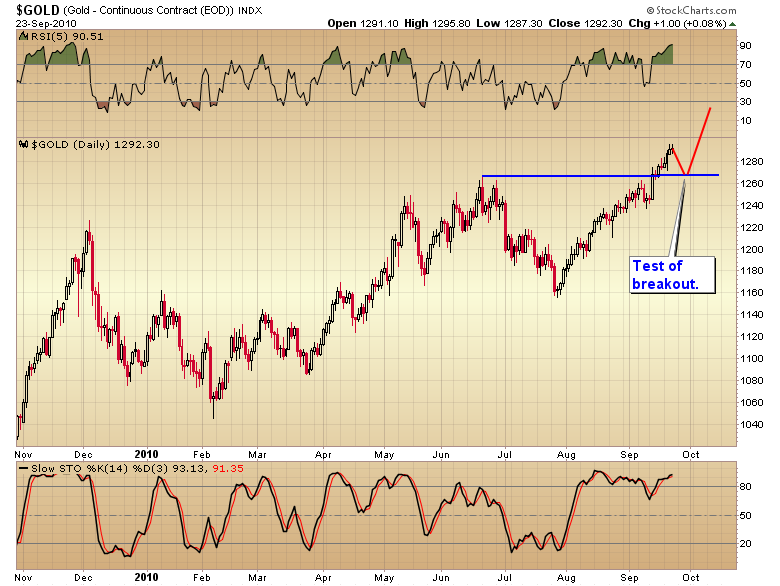 My thinking is gold should drop about 35 points to test the breakout level at $1265. 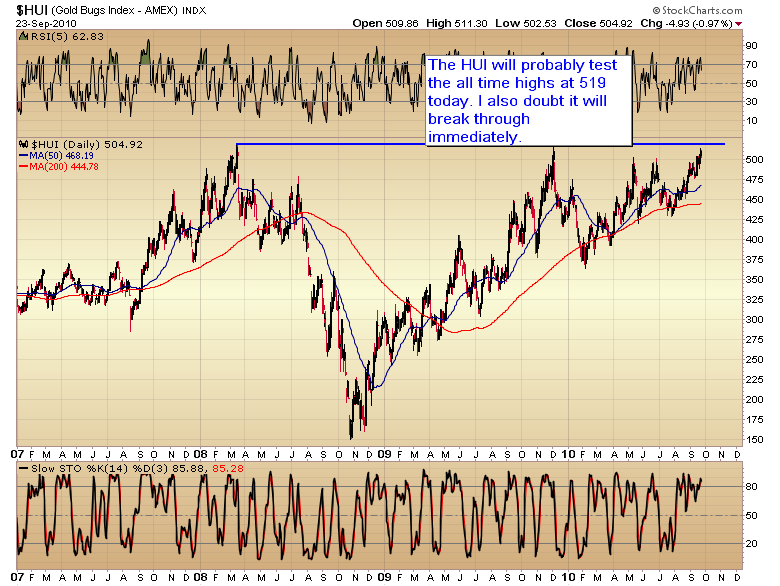 A throw back to test the triangle breakout by the HUI would also be a normal corrective move. 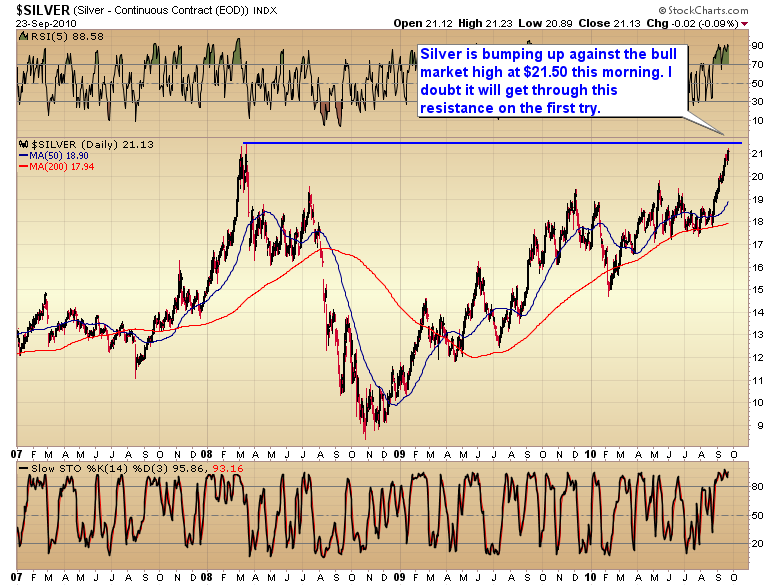 Once silver & miners join gold at new highs the entire sector will be trading in a vacuum with no overhead resistance. This will be like throwing gas on the fire. And that is the recipe for huge moves. It’s been my position for a while that Bernanke’s monetary policy would eventually create a currency crisis in the worlds reserve currency. 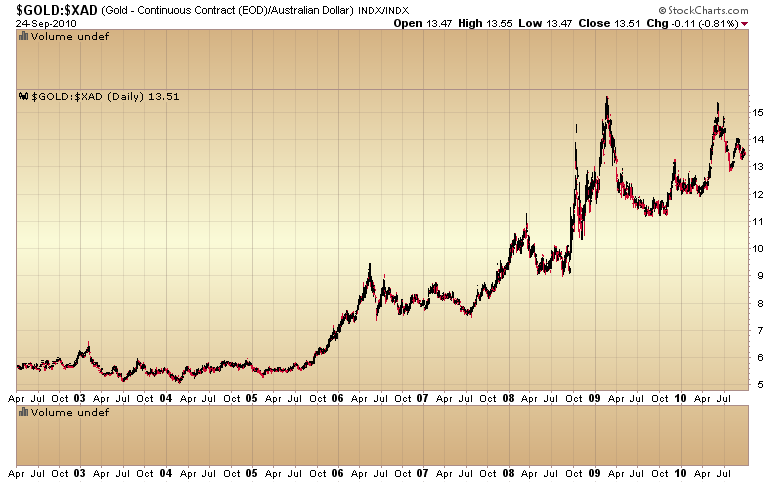 I warned that crisis would begin as soon as it became apparent the dollar was caught in the grip of the 3 year cycle decline. I had three conditions that had to be met before I’m was willing to call the beginning of the end. 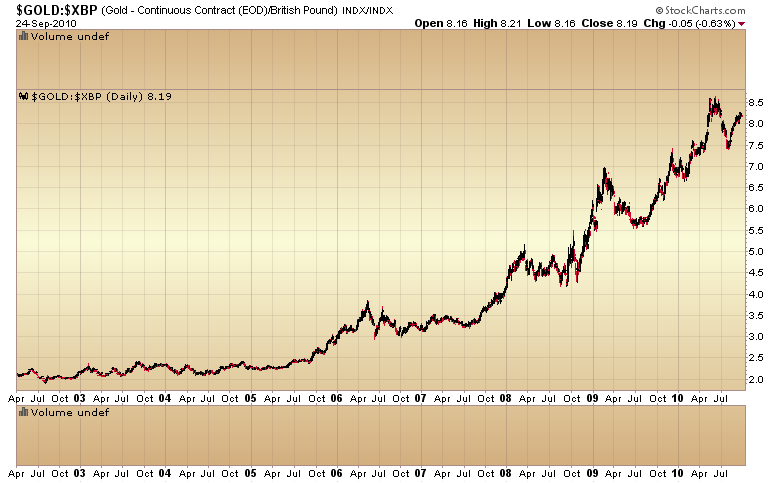 The first condition was for the dollar to move below 82. That was the warning shot that problems were developing. The second and third condition were a move below long term support (80) and a failed intermediate cycle. The drop below 80 this morning has now completed the final two conditions. I’ve marked the last three intermediate cycles with the blue arrows. The move below the last intermediate cycle low this morning initiates a failed intermediate cycle. This is also an extremely left translated cycle. Left translated cycles tend to produce the worst losses as they have a long time to move down. The ongoing cycle shouldn’t bottom until it puts in a larger degree yearly cycle low in November or December. 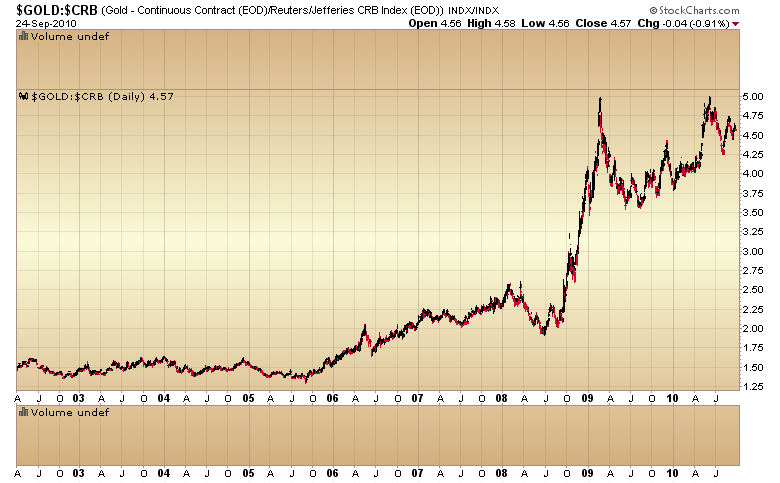 I expect that low to test the `08 bottom at 71. Finally we should see a full on mini crisis by the time the dollar drops into the major 3 year cycle low next spring or early summer. I’ve been pointing out for months that deflation just isn’t a possibility in a purely fiat monetary system. A determined government can create inflation any time it wants as long as they are willing to sacrifice the currency. I think it’s safe to say the United States has no compunction against destroying the dollar. 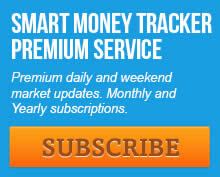 We are now heading into an inflationary storm that will expose deflation theory as the pure nonsense that it is. This entry was posted in Uncategorized on September 22, 2010 by Gary. The market is now 16 days into the current daily cycle. We typically see a minor half cycle correction around day 15-20. I’m guessing the Fed is going to give the market exactly what it wants to hear today. I also think the market has already discounted that. I expect the “news” will be used to take profits after the strong rally of the last three weeks (the pullback into the half cycle low). I also expect bears will mistakenly see this as the market finally coming to its senses and heading back down. Unfortunately I’m afraid they will be wrong again. This should only be a brief profit taking event to dampen sentiment before the next push higher. Possibly to test the April highs. This entry was posted in Uncategorized on September 21, 2010 by Gary. The S&P has now joined the Nasdaq 100 in completing the 1-2-3 reversal. 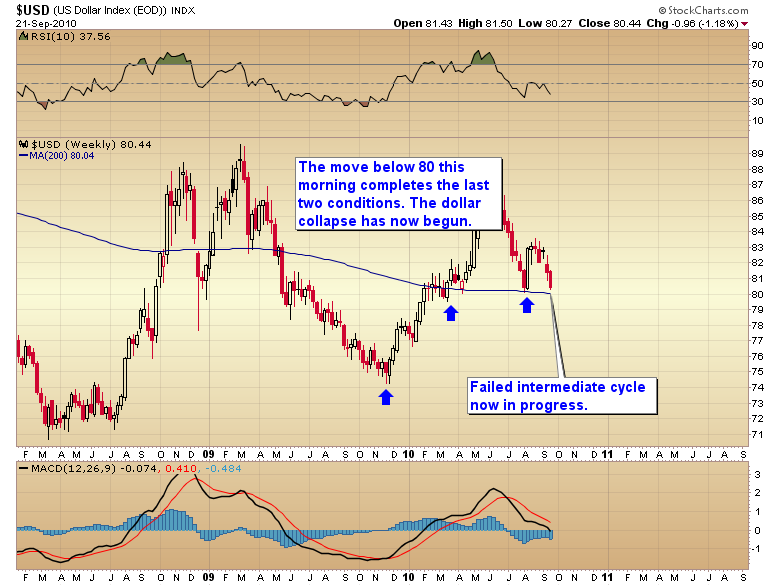 Now whether we get any follow through next week will depend on if the dollar continues down to test 80. Note that Friday was day 14 of the current daily cycle. 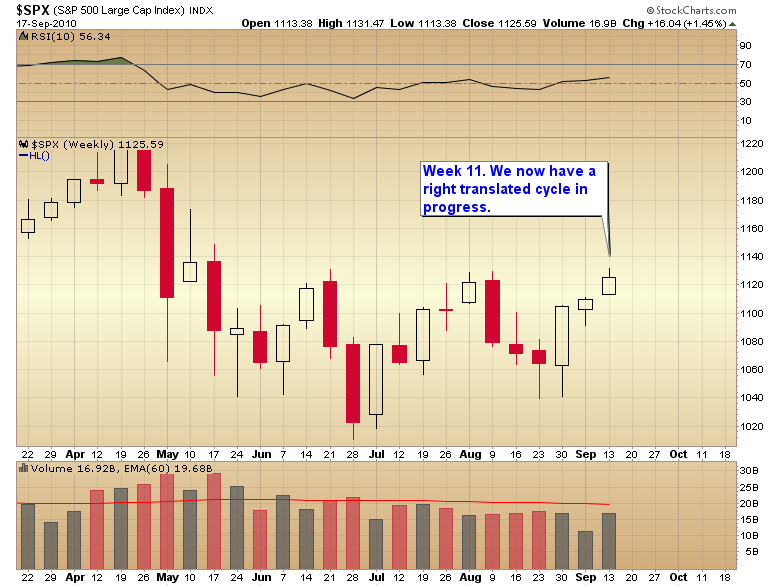 We usually see a minor half cycle correction sometime around day 15 to 20. So we should expect a short term top any day now. However I expect the pullback will just serve to dampen sentiment a bit so the next push higher can begin. 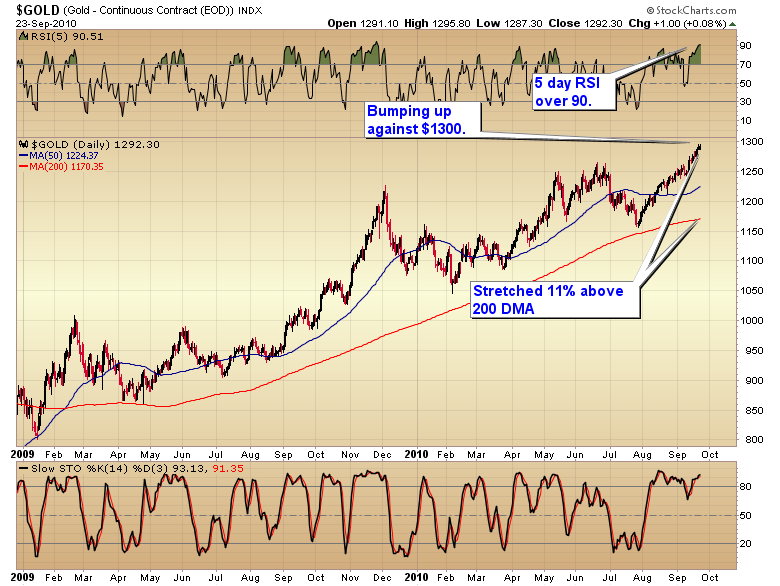 If I had to guess I would say the market will likely find support at 1100. That means we are now dealing with a right translated cycle. The majority of the time right translated cycles hold above the prior cycle low. In English that means it’s now unlikely that the market will drop below the July low of 1010 at the next intermediate cycle bottom due in mid to late November. How is that possible you ask? The economy is in dumper. Well first off never make the mistake of thinking the economy determines whether the stock market goes up or down. From 1932 to 1937 we saw one of the greatest bull markets in history. The Dow rallied almost 700% and it did it with unemployment holding above 14% and occasionally rising to over 20%. Let me show you what is driving the stock market. 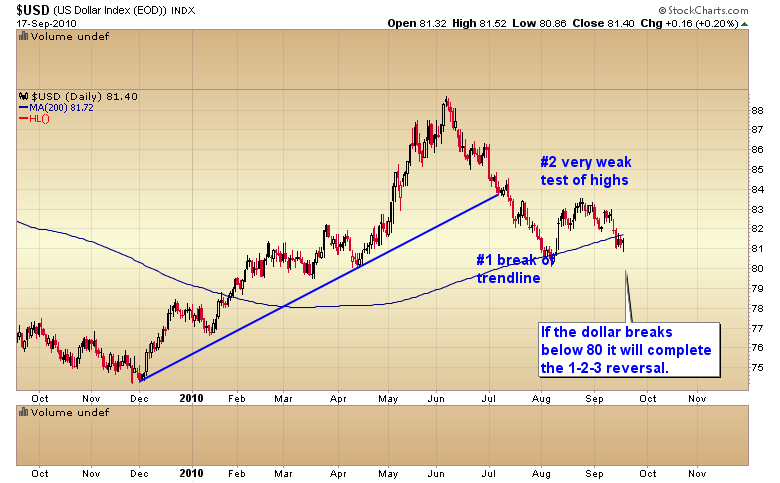 The dollar is in the process of it’s own 1-2-3 reversal. If it breaks below 80 we will have confirmation that the counter trend rally that started last year is over and the secular bear trend has resumed. 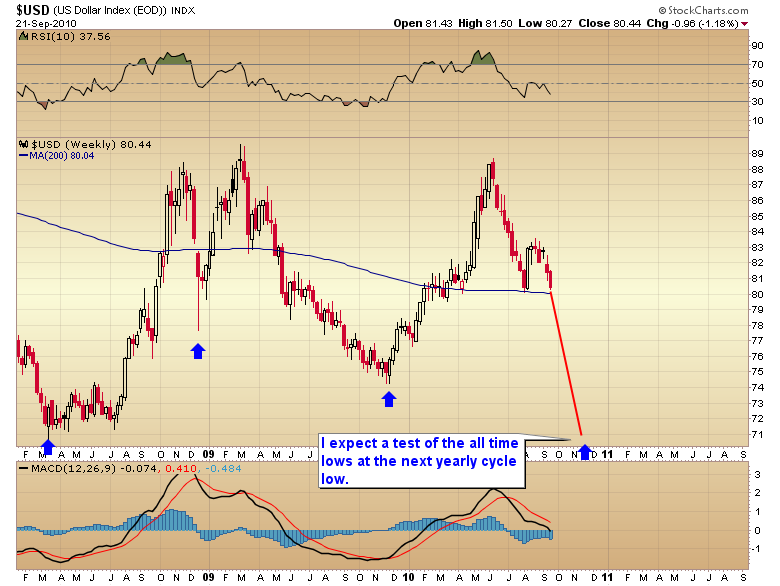 I’ve been warning for sometime that the dollar is due to drop down into a major 3 year cycle low. 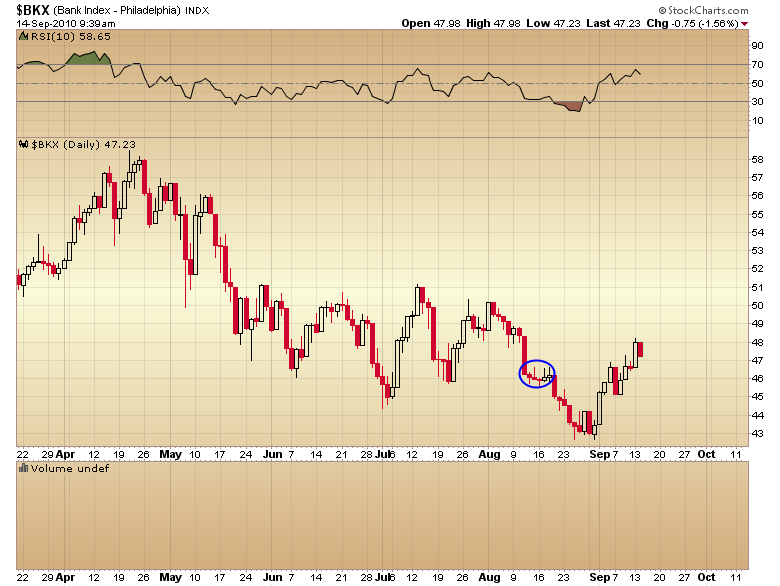 A falling dollar is a sign that Bernanke is printing too many of them. He’s trying to support asset prices and create the illusion of prosperity. He is probably going to succeed in creating asset inflation. However, in the process he is going to do tremendous damage to the global economy. At some point the market will recognize that, and the global stock markets will roll over into the third phase of the secular bear market that began in 2000. But until the market wakes up to the fact that a currency crisis is brewing don’t be surprised if we have a brief period where it will appear that everything has been fixed. The initial phase of a currency debasement is often mistaken as an improving economy. It’s not. In reality Bernanke will be doing massive damage to the economy. 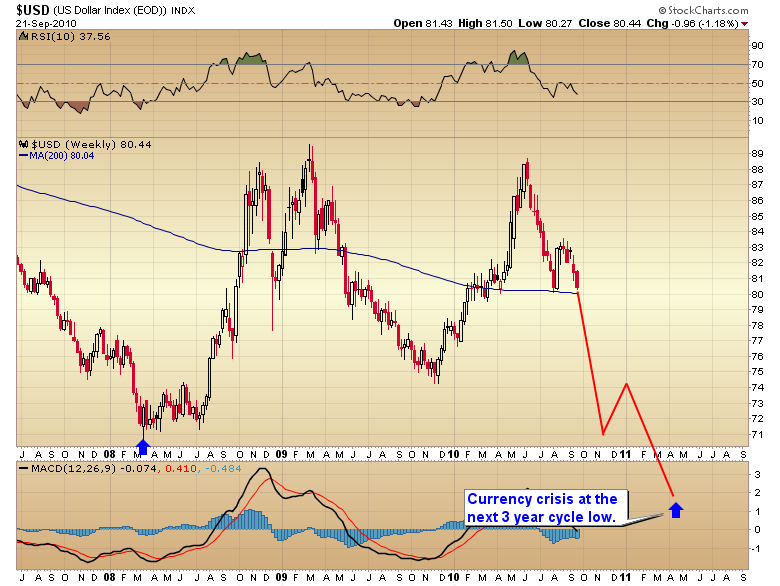 At the dollar’s next 3 year cycle low, due next spring, we will be dealing with a mini-crisis in the dollar. That is going to cause surging inflation problems. Gold is already trying to warn us what is coming for those that will listen. Since we were talking about trend lines let me say this again for those that forgot during the July correction. 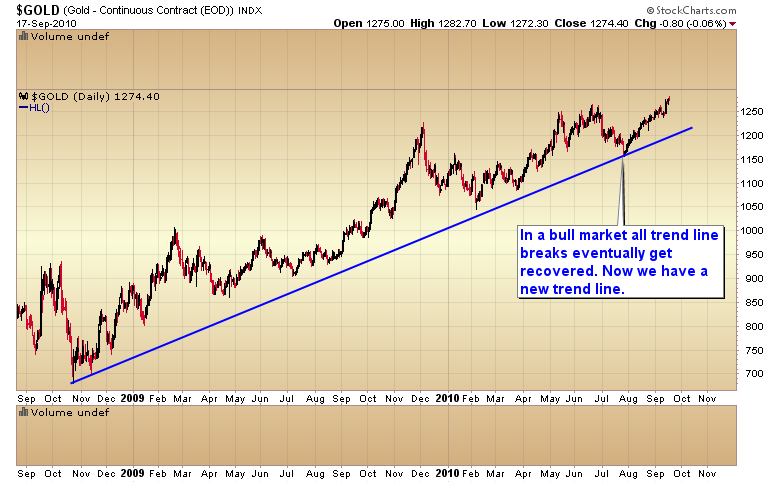 In a bull market all trend line breaks will eventually be recovered until the secular bull finally comes to an end. 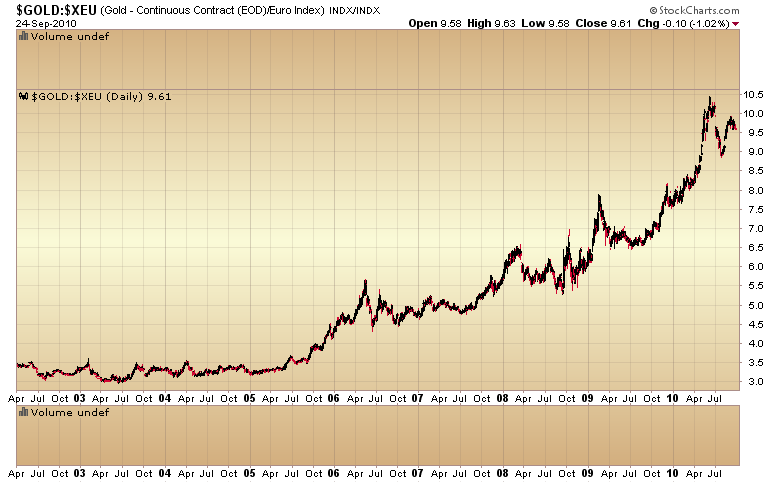 In July I saw gold bears falling all over themselves because the trend line from the Oct. `08 bottom had been broken. 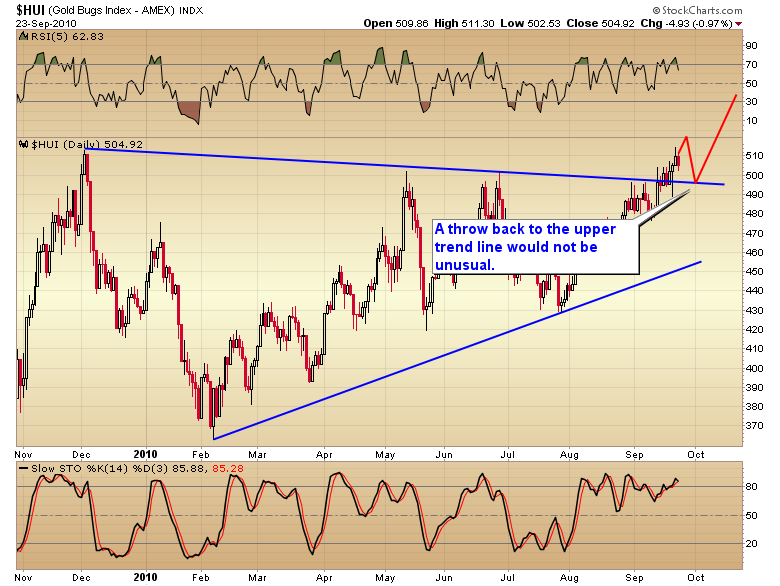 I knew at the time that it was a mistake to attach any significance to the trend break. At the end of the article I said the “the bears are going to be wrong again”. And of course they were wrong again. 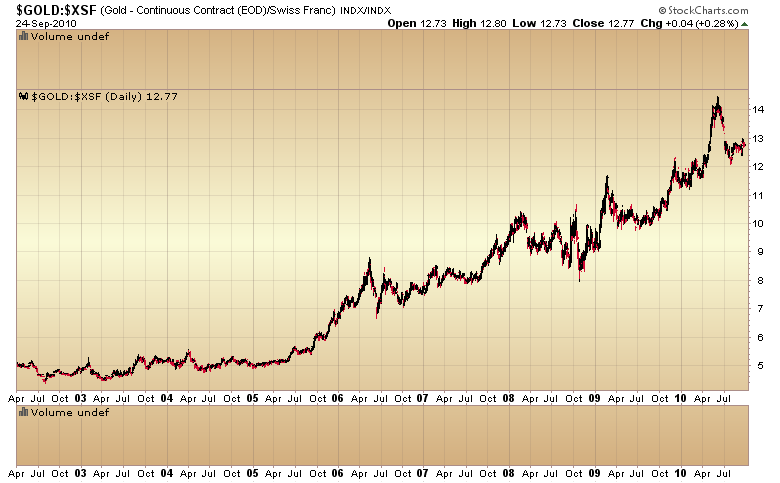 Gold has gone on to make new highs just like I knew it would. And we now have a new trend line to watch. Sooner or later this trend line too will break and just like the last one it also will be meaningless. 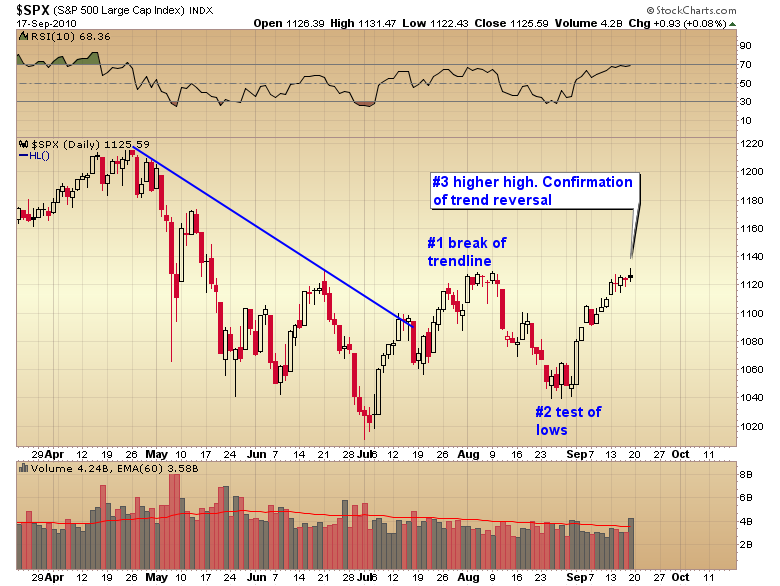 These trend breaks are one of the most effective tools the bull has to shed riders and punish shorts. When the next break comes are you going to let the bull sucker punch you again or are you going to see it for what it is? A major buying opportunity. This entry was posted in Uncategorized on September 19, 2010 by Gary. Everytime I hear a politician or economist call for more stimulus to create jobs I just shake my head and wonder, do these people really not understand what is happening in the jobs market? Do they really not understand that government can’t legislate prosperity? All governments can do is steal from…errr I mean tax it’s citizens and then throw it away on nonproductive make work jobs. Seriously how does it help the country to tax a productive citizen and then use that money to pay another citizen to dig a hole. And if you think that is ridiculous the government will then pay someone else to fill the hole in. How in the world is this a rational use of capital? Let me lay out the series of events that led to the mess we are now in. From 1982 to 2000 we had two completely new industries created. The personal computer and Internet. These two technologies drove an incredible productive phase in history. They created millions and millions of jobs. But as always happens when a new technology hits the market there is over expansion. By 2000 there were too many tech companies. Many of them had no earnings and never had any realistic chance of ever earning a dime. As always happens when expansion reaches over saturation the market will act to clean out the unhealthy companies. That cleansing process was the bear market from 2000 to 20002. Millions of jobs were lost as the tech sector contracted. That was unacceptable to politicians and the Fed, so Greenspan slashed interest rates and printed billions in a vain attempt to side step the natural economic forces. The end result the Fed created the conditions that led to the real estate and credit bubbles. Those twin bubbles temporarily created millions of jobs in the construction and finance industries to replace the jobs lost when the tech bubble collapsed. Unfortunately as we now know this was a phony economy built on a massive credit expansion and not a sustainable economic expansion. As expected the bubble imploded. When it did we again lost all those jobs that were created in the bubble sectors. We also lost a lot of marginal businesses that were only surviving because of the false economic expansion. So instead of halting the bear market in 2002 Greenspan just created a much bigger mess. Now politicians are trying to create jobs by taxing and spending. That’s not going to fix the problem. In order to fix the unemployment problem we need the next “new” industry to come online. The computer and Internet drove the economic expansion in the 80’s & 90’s. Electronics and plastics drove the expansion from 45 to 66. The automobile and mass production drove the bull from 1920 to 29. We are never going to get out of this mess by taking money from productive members of society and giving it to unproductive members to dig holes. We need the next “new thing” to come online. My best guess is that it will come out of the biotech sector. If politicians really want to create jobs they should direct funds into research and development in the biotech industry and speed up the process of finding and bringing online the next new industry. This entry was posted in Uncategorized on September 15, 2010 by Gary. I’ve talked about volatility coils in the past. Contrary to what most people believe the initial move out of a coil, even though it is usually pretty aggressive, usually tends to be a false move that is soon followed by a more powerful and durable move in the opposite direction. We now have two coils that are in the process of reversing. Well actually one is reversing, the BKX has already reversed. Along with the dollar collapsing this is just another sign that the August highs will most likely be taken out soon and I expect we will see a move to new highs before this daily cycle tops. This entry was posted in Uncategorized on September 14, 2010 by Gary. 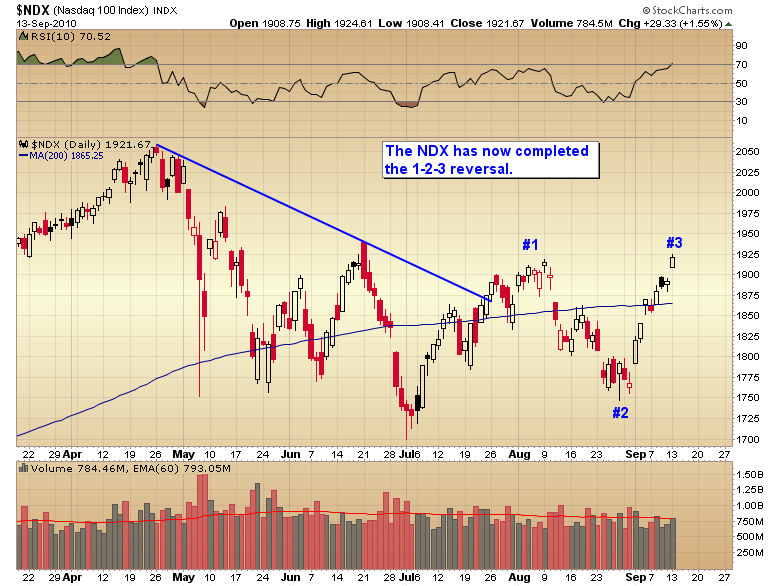 The Nasdaq 100 completed the 1-2-3 reversal today by rallying above the August high. We now have a confirmed trend change on the leading tech sector. With the dollar breaking down it’s probably just a matter of time before the rest of the market follows tech. Then we can probably expect a test of the April highs before this daily cycle tops. This entry was posted in Uncategorized on September 13, 2010 by Gary.